We are back after an extended vacation. I spent some time in Las Vegas for a friends wedding and with the busy holiday season haven’t had as many photo opportunities. 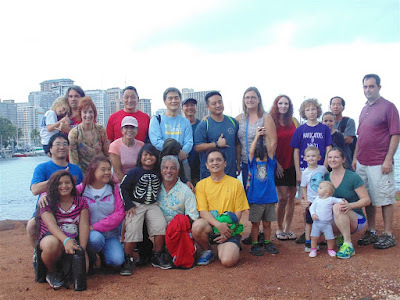 We begin the final stretch of the year with this group shot from Bob’s Magic Island Moonwalks. Bob (center yellow shirt) runs these on occasion and it always good to catch up with friends and meet new ones on the moonwalks. Here is the view we had on Bob’s Magic Island Moonwalk. 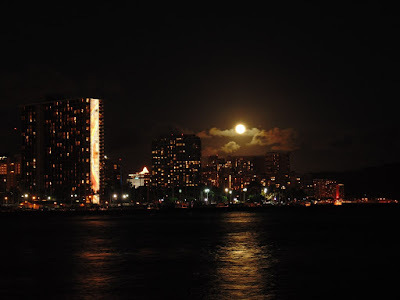 The moon rose over some of the Waikiki hotels unfortunately it was shrouded in clouds at first but it managed to appear a little higher in the sky. The building on the left is the Hilton Hawaiian Hotel with its lighted rainbow design. 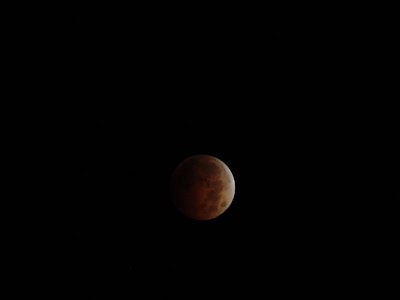 We interrupt our CANstruction 2014 series to bring you scenes from last nights total lunar eclipse which was visible in Hawaii. This is the second of a tetrad (4) of lunar eclipses that started in April 2014, Oct 2014, April 2015 and Sept 2015. 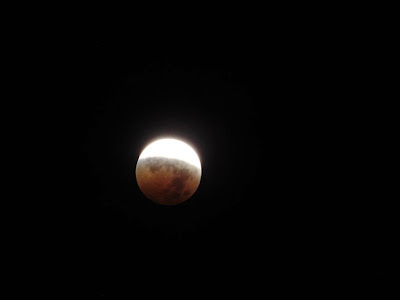 Hawaii was lucky enough that both the April 2014 and last nights eclipse was a total “blood moon” eclipse. 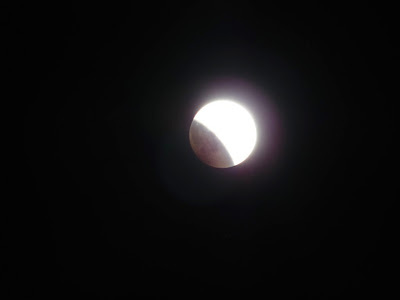 The top photo shows the early phase as the shadow creeps up the moon slowly engulfing it. This second photo shows near totality. This is when the sun, Earth and moon form a straight line and the Earth blocks any direct sunlight from reaching the moon. The Earths shadow covers the entire moon. This is sometimes called the red moon or blood moon. This effect is caused by the Earths atmosphere refracting some sunlight which indirectly lights up the moons surface. This last photo show the moon slowly reappearing from the Earths shadow. From the start to the end the eclipse last approximately four hours. If you missed this one unfortunately you will have to wait until January 31, 2018 for the next total eclipse to be visible in Hawaii. A partial lunar eclipse will be visible Apr 3/4 2015.